Medicos enjoyed 1st April with DNB and NEET PG results - AcrossPG Exams! Indian medicos, who appeared for NEET PG and DNB exams in Nov - Dec 2012 enjoyed The 1st April 2013 with DNB and NEET PG result declaration rumors. 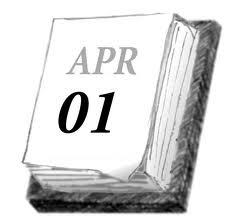 Today is 1st April and traditionally it is celebrated as 'April Fool's Day'. Friends try to make fool of other friends on this day for fun. Among medical community, as soon as clock hit 12AM on 1st April 2013, FB and other medical websites were flooded with rumors of declaration of DNB and NEET results. The students who got trapped made fool of themselves. Some students took it lightly and joined in this humor to try and fool other medicos, but some got angry and started abusing the original posters of such rumors. Medicos who are frustrated to the extreme due to veryyyy long delay of NEET and DNB results, tried to lighten their tension by playing such pranks. On the other hand apart from jokes, DNB and NEET results have not been declared yet. Next NEET PG hearing is on 2nd April 2013 (tomorrow). Stay on NEET results is still effective. We advice not to take any serious action based on such pranks and always check the official natboard website http://natboard.edu.in for updates on results.